I know we’re all tired of this election cycle, and I’m sure some of you – who may not share my opinions – would appreciate not having to scroll past my political jokes every couple of days. I’ve never been one to consciously push my views onto other people. I try to be very cognizant of that. And to be honest, I always hesitate whether to share *any* socio-political thoughts here on Facebook. That said, I’ve been far less reserved since Donald Trump won the Republican nomination. He terrifies me for a litany of reasons, but I’m not going to address all of those here. As I’m sure many of you are now aware, a video containing a disgusting conversation between Trump and a news anchor has recently surfaced, wherein Trump talks about a failed attempt to seduce a married woman into sleeping with him (at a time where he’d just married his third wife). He goes on to talk about how, because he’s wealthy and famous, women will just let him do anything he wants, such as grab at their genitalia. Some of Trump’s supporters are saying this is just “guy talk” or “boys being boys.” Some are saying the video holds no clout because it’s 10 years old. Some are saying these are just words and they don’t hurt anyone. Well, I have a problem with that. That’s not “guy talk” or “boys being boys.” I don’t know who these people hang out with, but this is not the kind of thing *anyone* in my circle of friends has ever said. Not when we were stupid teenagers, not as adults, not in jest, not in casual conversation. NOT EVER. And it’s not because we’ve shown restraint. It’s because decent human beings don’t think that way. Words have consequences, and in this case, they outline a man’s behavior. They detail his actions. A married man boasted about his attempts to convince a married woman to sleep with him. And as if his public persona isn’t bad enough, this shows exactly what kind of person Donald Trump is when he thinks no one else is listening. Not only are his *words* damaging to women, they also describe his predatory actions, nature and behavior towards women. I have a mother, a sister, nieces, aunts, a grandmother and many good friends who are women. Someday, I hope to have a wife and a daughter, and I will not keep quiet when a man who views them as objects of sexual triumph is at the precipice of being elected to the highest office in the world. Additionally, I also hope to have a son one day, and I will not support anyone who demonstrates and/or propagates this obnoxious, disgusting and antiquated notion that women are objects for men to own and do with as they see fit. It’s an eight-episode Netflix original series set in 1983 that channels classic Spielberg and other exemplar sci-fi. Think E.T. mixed with The Goonies, blended with Akira and The X-Files. It’s reminiscent of Super 8 (co-written by Spielberg), with shades of Chronicle and occasionally even imagery from Alien. It’s heavily inspired by a specific era in movies and television, but is still very much its own work. Basically, it’s kids on bikes investigating paranormal events while eluding the watchful eye and exasperated grasp of the federal government, all without overbearing helicopter parents and the intrusive pervasiveness of cell phones and the Internet. And it. is. awesome. If you dig that, then you’ll dig this. 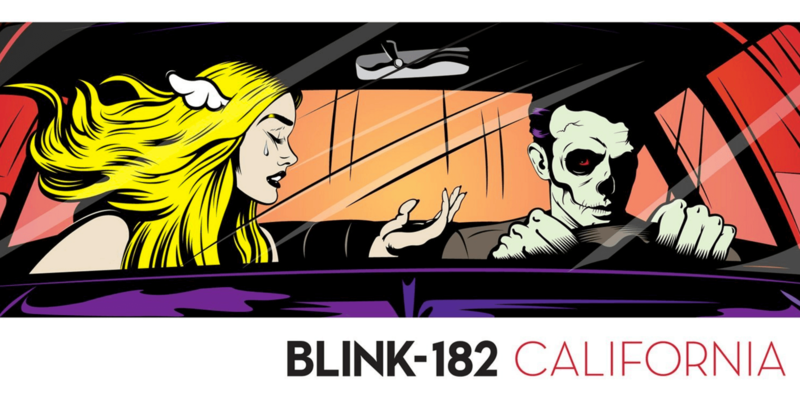 You’d be forgiven for not knowing blink-182 put out a new record two weeks ago. Admittedly, I’ve only barely paid attention to what the band was up to the past 10 years. In that time, they put out just one record, which was 2011’s “Neighborhoods” – an album from which I haven’t heard a single track – and that was after having been on hiatus for four years. But this new record is called “California,” and it’s their first without Tom, who left the band for a variety of reasons. In his place is Matt Skiba, who you might (or might not) recognize from Alkaline Trio. I’d been led to believe this album wasn’t very good, but considering there was a time in my life when their music was practically what I lived for, I felt obligated to give it a shot. There are moments in this album where I almost feel as if I’m 14 again, but it doesn’t linger, because without Tom’s endearing still-whiny-at-40-years-old voice, the band sounds a little more grown up. I won’t say ‘mature,’ because the album still has a couple of sophomoric gag tracks. I’ve listened through this new album four times, and I like it more each time, but this isn’t the blink-182 you remember. Mark’s signature “pingy” bass riffs are still intact, and Travis’s tight drumming still drives each song along, but it’s definitely a different sound without Tom. It’s familiar but different, and Skiba is a competent replacement, although I can’t pinpoint what his unique contributions really are. I loved blink-182. They were my favorite band throughout most of my teenage years, and intensely so. Yeah, we all had ‘Enema of the State’ and ‘Take Off Your Pants and Jacket,’ but I tracked down copies of ‘Dude Ranch,’ ‘Cheshire Cat,’ and ‘Buddha,’ which was no easy task in the early 2000s. They were silly, fun and energetic. They were the reason I took up playing bass and wanted to have my own garage band. They were the reason I tried (and failed, haha) to be a “skater.” I even emulated the way they dressed. I guess that’s typical of kids at that age. But people change and tastes evolve. I don’t really listen to pop-punk anymore, but I can definitely still enjoy it, even if only to reminisce. Like most people, my musical preferences are sort of all over the place, but I guess I’ve mellowed out in my old age, haha. And that’s what I find interesting. While a band like Weezer transitioned into “mid-life” seamlessly and with relative ease, blink has always been preoccupied with adolescence and embracing immaturity. But that charm starts to fade when you’re closing in on 45 and still singing about the antics of your teenage years. So while it’s clear they’re trying to bridge the gap between where they were and where they’re going (some of their lyrics overtly say as much), they haven’t shaken that youthful punchy-ness entirely. And maybe they shouldn’t. That’s their trademark. It’s just gonna be hard to carry into their golden years. That said, “California” is good a record. It won’t knock your socks off, and maybe it goes a little heavy on the harmonic “woah” choruses, but you’ll find yourself wanting to listen through it again. The International Space Station was set to fly directly overhead this morning, from NW to SE, at 5:34 AM. So when my alarm went off at 5:00 AM, I threw my clothes on and I ran outside to set up my gear. I’d already done my measurements last night, so I knew where to set up, where to look and what the trajectory would be, that way I wouldn’t be fumbling around in a panic this morning, in the dark, trying to get set up while the clock counts down. Planning ahead. Smart, right? Well, first, the newspaper dude comes flying down the street, blasting Nirvana, with his brights on, both bewildering and blinding me in the process. That caused me to drop the screw holding in the diagonal mirror and the eyepiece, which meant the weight of my iPhone and its mount kept making it slide and flop down. So I had to get down in the wet, dewy grass with my flashlight, feeling around for it for about five minutes until I finally found it. So I get that put back together. That left me a little discombobulated, but I got everything set up again, regained my composure and settled into my chair, thinking I’m ready to go. I checked my watch to see that it was 5:32 AM. The ISS would be passing over very soon. It was only going to be in the sky for a maximum of six minutes, however, that includes the time it’s hidden by the treeline both in front of and behind me. Also, since it would be going directly over my head at the 90° position, I can’t very well crane my neck and position my telescope to look directly above, and I can’t move my gear quick enough to spot it in my scope as it moves behind me. I say this all to make the point that I’ve really only got a minute, maybe two, to find this quick-moving object, focus my scope and my camera, and snap a couple photos. Alright, well, I know where it’s coming into view, so I’m ready, right? It was just as the ISS came over the treeline that the tripod plate, which holds the telescope down, decided to come loose. To tighten it, you have to take out the plate, which can be an ordeal. Ain’t nobody got time for that right now, so I’ve gotta wing it. With my left hand, I’m controlling the Y axis of the tripod so I can easily track the ISS across the sky. With my right, I’m trying to keep the scope from flopping around, while also clicking my camera remote to snap the photos. Not even my Prius would make that trip. The sky’s clear tonight, so I was just out looking through the telescope again. The past couple of nights were rainy and cloudy, so that was a bust, but it’s perfect this evening. I like being outside after dark. It kind of feels like you’ve got the whole world to yourself. The lights are out and everyone’s gone to bed. It’s pleasantly quiet. All I can hear is the sloshing of the creek, crickets chirping and the whistle of a distant train. With my left eye squinted shut and my right peering through the eyepiece, I set my gaze upon Arcturus, a red giant star about 26 times larger than the Sun, and approximately 37 light years away. That got me to thinking about a conversation I had last night with some friends as we stuffed ourselves with burritos. We wondered how long it would take to drive to the Sun. We didn’t get far into the discussion before getting sidetracked, but we were on the topic long enough for me to do the math on my phone that told us it would be the equivalent of 3,720 trips around the Earth, assuming you were driving around the equator (and could drive on water, teehee). So tonight, I started wondering more specifically about how far that really is. To start out, the Sun is 93,000,000 miles away. Light, the fastest thing in existence (that we know of) takes approximately seven minutes to reach us from the Sun. Of course, we’re talking about driving our car to the Sun (let’s just pretend that’s possible), so we won’t be traveling anywhere near that fast. For the sake of familiarity, I’m going to say we’re driving 60 MPH, just like you would on the interstate. That’s the speed limit in space, so don’t let the galactic fuzz catch you speeding. So we’re planning our trip. We’re talking about going 93 million miles at 60 miles per hour. That means it’ll take us about 1,550,000 hours of non-stop driving to get there (sorry, no potty breaks). To break that down further, that’s about 65,000 days. Or, if my math is right, roughly 177 years. That’s how long it would take us to drive from the Earth to the Sun. One hundred and seventy seven years. Better stock up on the snacks for that trip. We get so caught up in talking about other stars, planets and galaxies, we start to lose perspective. The Universe is so vast that our brains can’t comprehend it. And there are stars that make ours look small by comparison. But it’s not small at all! Our own galaxy, the Milky Way, is 100,000 light years across. That’s huge! But even our own solar system is MASSIVE. It’s just bonkers, man. And it’s pretty humbling. It’s gonna take some time to really get good at using my telescope, but in the two hours I was at it, I felt like some kind of low-level scientist. Like, a really incompetent one, haha. But a scientist, nonetheless. Still, as I finally got my lens pointed at and focused on Jupiter (which is waaay harder than you think), I was able to see its four main moons. That’s bonkers! Think about that. Jupiter is currently 453 million miles from Earth (according to WolframAlpha), and I am able to see it and its moons with a tube and a few pieces of glass. And really, I’m basically doing it the same way Galileo did when he discovered Io, Europa, Ganymede and Callisto, 400 years ago. It’s kind of incredible, and it makes me feel a sort of connection to ancient astronomers, knowing that I’m looking at the exact same celestial bodies in basically the same way they did when the cosmos were all but a mystery. When I took astronomy in college, I was fascinated with the science, the facts, the concepts and the theories, but I always got lost in the math (there’s a reason I opted for a writing-intensive major, ha!). I like to think there’s an alternate universe version of me whose brain doesn’t panic when confronted with something more challenging than arithmetic, and maybe he got into astrophysics, haha. Despite the panicked narrative that the sky is falling, I’m really not all that bothered by the news that came out of Nintendo’s investors’ meeting this week. Nintendo announced that the tentatively-titled “NX” console will launch in March of 2017, but will not be discussed at E3 2016. The main focus this E3 will be on the newest installment in the Zelda series, which Nintendo said will release on both Wii U and NX. But that’s really chapped the lips of a rather vocal pack of Nintendo fans, because apparently releasing a game simultaneously on current and next-gen platforms reduces the amount of fun you can have. There are tons of variations on the sentiment that “Nintendo took us for fools!” because “we bought the Wii U for Zelda,” and now… it’s still coming out on Wii U.
I dunno, it seems like it takes so much effort to get so bent out of shape over something like this. Maybe this would bother me if games were the only passion in my life, but that hasn’t been the case since high school. I have so many interests that waiting a little while longer just doesn’t phase me. Plus, as much as I love games, there’s no reason to let them ruin your day. Nintendo’s working on a lot behind the scenes. It takes time to correct the course of such a big ship. I know people are getting antsy, but we’ll get there. I made the mistake of making a trivial, offhanded comment in response to someone’s panic attack, where I said they were acting silly. As an aside, his comment about “never accepting what we have” and “always striving for better” makes it sound like he’s talking about fighting for civil rights or something, haha. I just find it really silly how seriously people take this stuff. I’m not saying I’m incapable of getting into an enthusiastic discussion about Nintendo, BECAUSE I DEFINITELY CAN, but it just doesn’t consume my every thought. I’ve got other things to enjoy while I wait for Nintendo.